The A & B Stories: Five years, and a custom FREE painting giveaway! 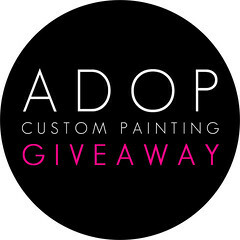 Five years, and a custom FREE painting giveaway! I have been writing this blog for five years as of today. What? How is it possible that I didn't loose interest after the second week? I'm baffled. When I first started this blog, I kept it private, thinking it would be just me and my Mom that read it forever. The first 30something posts were about our dog, so it was pretty interesting stuff. It was only this time last year that I decided to move it to blogger and actually welcome readers. I had since expanded the blog to cover our previous home changes and sale, our wedding, our new home makeover, and our amazing baby Ben. Since the move, I've gone from about 2 readers a day (my Mom, and Billy's Mom, Norine, love you guys!) to hundreds of unique readers. I don't know who all of you are out there, but thank you for stopping by! Say hello from time to time! Anyway, I am excited about the fact that I've had a writing outlet for all this time (writing was my original dream) and it really does make me happy to come back to this and post little bits of our life. And the occasional list. I'm also SO excited about how ADOP has done. I've read stories about artists starting out and waiting years (if ever) to sell their work, and I've been selling my work on a regular basis since I launched last Thanksgiving. I'm SO GRATEFUL! And I have plans for the future. I'm currently working on a couple of exclusive painting lines for two boutiques that are opening soon (I'll share the details once it's all live! ), I have commissions currently that I'm finishing up, and I have ideas on some additions/changes for my kids line. Big plans. I can't WAIT. Anyway, to celebrate my big 5th blog-aversary I would like to host my very FIRST giveaway. This probably won't be a regular thing, I think it would be unfair to give my Mom THAT many free paintings (kidding Mom you can have as many as you want). But who knows, if people are into it, I'd love to do more. Any excuse to work on a new painting! Ok, let's get to it, here's the giveaway! ...whatever you like, as long as it fits in with the painting style that I typically offer. If you have something else in mind, we can chat. I never thought I'd be able to paint the Eiffel Tower after all, and that happened. And in case you're wondering, shipping is also on me. This contest is for a new painting, but if there's a painting in my shop currently (this size) that you would prefer to have, let me know. Also...if you are really interested in a larger piece (either in the shop, or a custom one you want), we can put the value towards it. A winner will be selected on Friday June 1st, and to enter all you have to do is leave a comment below. You don't have to say anything at all, a single punctuation mark will do. Or you could be sweet and leave a little note for me. Whatev. Ok, common guys, please enter. Please? I love your art! The bokeh inspired ones are my favorite! ...and thanks Lisa as well! Saw your link through my sis, Becky. Love the nursery art!! You're very talented. Saturday plans are quite fitting given this milestone! Ruthie J (or P, if that's better)lol. I enjoy supporting my local artists... Congrats on your 5 year anniversary! Here's to another 5 fabulous years and more! Nolan hopes he wins so he can have a beautiful painting for his nursery! Great job Adriane! You know how we feel about your work. Just about everyone that comes by the house has something wonderful to say about the pieces we have hanging on the wall. You're super-talented and a fantastic person to boot. Can't say fairer than that. Congrats on your longevity. You know June 1 is my birthday... (if that has any sway on the randomly picked winner). I also love the new format of the blog and the more frequent postings. I get addicted to certain blogs and want to get fresh stuff from them regularly, so I love that even though you're a busy mom, you're still making time for your readers. Wish I could make time the do the laundry, let alone make time for a blog. Keep up the good work. Love your paintings, very unique! So enjoy your blog, and love your art :). Thanks to you, Jackson has the sweetest custom painting in his nursery...best part of his room :). Happy 5th anniversary!!! Great 5 years. Love your work and would be privileged to own a piece. Love you artwork - especially the nursery pieces! if i win something travelly/morocco. Hi Adriane - I wrote yesterday, but I was a day too early. So I just would like to know - how do you do it all?????? oh the days when I was young and could juggle 25 thing at once!!! now I can bearly chew gum and walk at the same time. With Ben, work, painting, gardening, blogging etc...Anyway, being your Mom's (yankee) friend forever... I think one of your paintings - anyone of them that remind me of the ocean - would look amazing in my NY home!!! LOL Lots of love, Diane Cooper!!!!!! Happy 5th! Just stumbled across your blog today and I can't wait to read backwards! Your paintings are lovely! Thanks Kim!! So happy you stopped by, your blog is great as well!! Hi Nikki! Thank you so much for reading, and for entering the contest! And congrats in your little one...isn't it the BEST? Just stumbled onto your blog - fabulous! Happy 5th Anniversary. Can't wait to get our little girl's paintings for our nursery! And thanks for being so helpful. We look forward to seeing what else you do for your nursery line. Your work is amazing to me - and your blog is a must-read everyday. I particularly love your dedication to doing what you love and I particularly love those rain-drop paintings....hahahaha. Hey Adriane, I heard through the grapevine you had gotten into paintings and such, so exciting... I searched but could never see any samples until now :) I love your style (both now and then :P) If you could, please send me the link where I can see the paintings you have for sale, I just bought my first home this past September and Ive been looking everywhere for the right piece!! jpotter@matrixgroupinc.net or jessicapotter777@hotmail.com - Take care and hope to hear from you :) OH, and HAPPY 5th Anniversary too!! Love a good Canadian blog! Happy 5th! 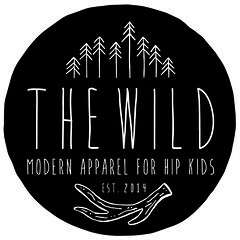 I love your blog and art work. You are a very creative cookie !! By the way I am Joan's cousin Carolyn and she introduced me to your site. I'm happy she did. Thanks so much Carolyn!! You are so sweet :) Thanks for stopping by! Same comment as yesterday. I showed your Mum a catalog pic of one of your paintings that I really loved. Some things you look at and think, "I get that". And that one I saw completely. Proudest Uncle Andy in the world. Aw, thanks Uncle Andy :) you are too sweet! Wow, time really does fly. 5 years already? Congratulations Adriane! You're such a talent and I love that I can call you one of my very best bloggy friends ;) this is the giveaway of my dreams! Here's to another 5 years BBF! Your art is amazing! So happy to have met you thru Corinne :) Good luck with the shop! I just discovered your blog this week and love your paintings. This is a great giveaway. Keep up the amazing work! you are so talented. Glad to see you doing something you enjoy so much although I do miss working with you. Congratulations on your 5th anniversary! The art is amazing! I'm not usually an abstract painting kinda girl, but I love yours! Congrats on the 5 years! Wow look at all these comments!! You'd be crazy not to enter. First time visiting your blog and I love it. Congrats on 5 years! Congrat's to being so successful and wow 5 years. I have been following your blog for about 1 year and I love your art. Thank you for the chance to win one of your fantastic art pieces. 5 Years! WOW! Congrats! You are actually the ONLY blog that gets hand delivered into my hotmail account. The ONLY one! Not to mention your wonderful art. We NEED this art in our home. Like, yesterday. Hoping I win!!!! I love the blog, love the paintings you are so talented!! Well done! Congrats!! Love your paintings! I am so happy you are living your dream....your amazing at everything you do! Thank you so much Katie :) you are sweet! Happy 5 year anniversary! Your work is great! A chance to win a painting by you? I'm in! 5 years? Me too! We are almost blog twins. Happy blogiversary!! Hello blogtwin! Ha ha, thank you so much Jen for entering, I wish everyone could have won :( but I'm definitely going to do this again sometime! Just found your blog through Paper Hearts. I'm happy to be a new follower! Your paintings are beautiful - hope I'm the lucky one... Happy anniversary!! Ha ha, yay! Thanks for entering the contest! I seriously love your abstract work!! Happy 5th anniversary! Quite an achievement! Saw you at BlogPodium and so glad I found your blog! Love your paintings by the way! Thank youso much Beatrice! Really hope we get a chance to chat at the next BP! Happy 5 year anniversary, what a milestone! I love your pieces! Happy five years! I'd love one of your modern abstract paintings - gorgeous! Wow - what a treat - no idea your blog was here. Glad I found it! OMG thanks Erica! I'm so glad you found me too :) hope you stick around! 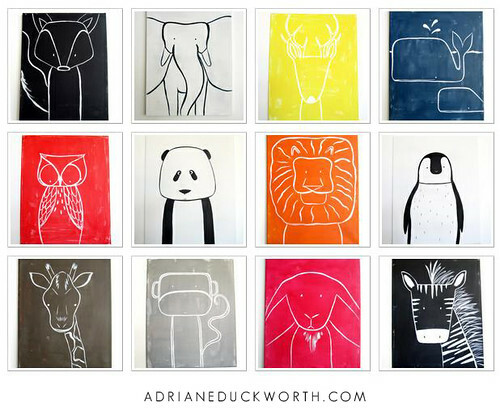 Love you art, especially the animals!! Amazing 5 years!! Congrats!! 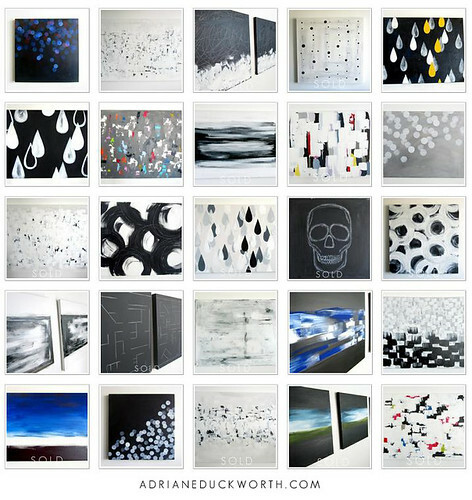 I love all of them, but I think I would have to go for one of the black and whites- would look awesome in our living room!! This is wonderful! Thank you so much for offering such a lovely and generous giveaway. Aw Hilary you are so sweet!!! Thank you so much for entering :) and for reading!! After numerous emails answering my many questions about your wedding venue (and being so lovely in the process!) I took it upon my nosey self to check out your blog as the link was at the bottom of each email. Many moons later and I still find myself drawn to the A & B Stories. :) Congrats on 5 years Adriane! You are as creative as you are beautiful! Happy Anniversary! (Today's my wedding anniversary so maybe that will bring me luck!) Love your art! Happy 5! Your blog and artwork is stunning. Keeping my fingers crossed! Here's to the next five years being as successful - congrats! Marc! Thank you so much for reading, and for entering the contest! Great chatting with you yesterday, VERY excited! Congrats on 5 years! I love your work and blog. Wow - 5 years. Congratulations! Oh, I would love to win! My seventeen month old son's room could use an adorable print OR our family room....my fingers are crossed. So glad I didn't miss out on this. I'd love a black and white piece for our living room. I'm trying to add more of a modern vibe to our place as a LOT (aka: most) of our pieces are vintage and I worry it makes everything look...well, old. So I ordered some black and white pillow cases and therefore a painting would look fabulous too! Ohhh 5 is just a great number! Personally my favorite. Can only mean great things ahead on your 5th anniversary. Congratulations and oodles of bloggie love.